Free knitting pattern for a colourful cushion cover. This image shows the back of the cushion cover. The front will depend on which squares you choose to use. Approximately 200gm 8 ply (DK) yarn in your chosen colour for the back of the cushion cover @ approx 90m (100 yards) to 50gm (This will also be enough for your i-cord edging). Sew your 4 squares together to form one large square for the front. K9 rows garter st. Cast off. Place the backs and front together with wrong sides facing and making sure that the side of the back with buttonholes is on top of the side that the buttons are sewn on. Sew together using mattress st. If desired, knit a length of icord and sew all around the outside seam. 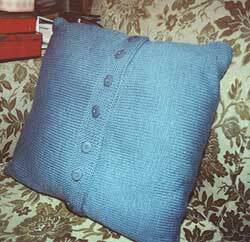 Sew on buttons to match the buttonholes and insert the pillow form.